Following her purchase of Hill Top in the Lake District in 1905, Beatrix Potter (1866-1943) made many studies of the Lakeland landscape in all seasons. This watercolour study of buildings and snow-covered hills is dated 3 March 1909, when Potter was staying at Hill Top in Near Sawrey. A number of other studies of the snowy Lakeland landscape dating from this stay are also in the Linder Bequest. Potter enjoyed sketching outdoors and thought the Lakeland fells 'even more impressive in mist and snow'. Beatrix Potter is one of the world's best-loved children's authors and illustrators. She wrote the majority of the twenty-three Original Peter Rabbit Books between 1901 and 1913. The Tale of Peter Rabbit (Frederick Warne, 1902) is her most famous and best-loved tale. 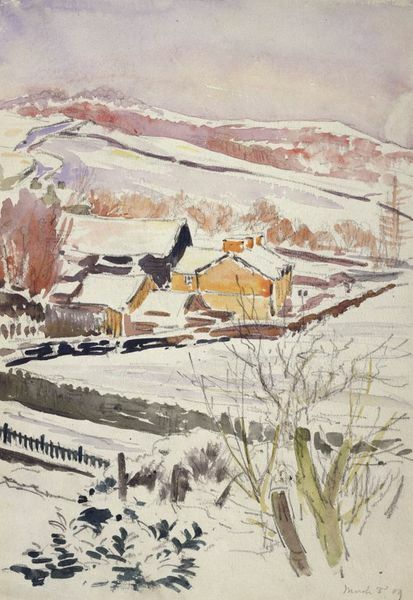 A drawing of farm buildings and a hillside under snow, completed in watercolour over pencil. The buildings are in the middle-ground of this portrait format composition, delineated in orange and purple. Beyond the buildings the hills rise up to meet the sky. A stone wall curves down from the buildings into the foreground, where there are also trees. 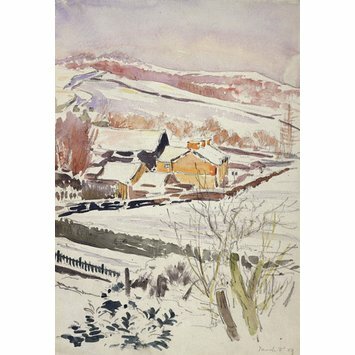 Pinks and purples have been used alongside white and blues to depict the snowy hills. Inscribed in pencil lower right by the artist. Inscribed in pencil upper left verso by the artist. Inscribed by Leslie Linder on a folder no longer in use. Drawn by Beatrix Potter in the Lake District in 1909. Acquired by the V&A from Leslie Linder (1904-1973) in 1973 as part of the Linder Bequest, a collection of ca. 2150 watercolours, drawings, literary manuscripts, correspondence, books, photographs, and other memorabilia associated with Beatrix Potter and her family. Watercolour and pencil drawing of buildings and snow-covered hills in Sawrey, the Lake District, made by Beatrix Potter while staying at Hill Top on 3 March 1909; Linder Bequest cat. no. 673.